Whether to use Online RSVP vs Mail RSVP Cards is a question that is getting asked more and more. Some people are worried about etiquette and whether it is acceptable to use online RSVP instead of formal RSVP cards. Others are eager to use modern technology. 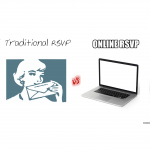 There are advantages and disadvantages to both Online RSVP systems and formal RSVP mail response cards. Which one is right for you is a question only you can answer, but we try to provide you with some useful information about both that can help you decide. We will also let you know which RSVP option we went with and how it worked out for us. Old fashioned mail RSVP response cards can have a unique classic feeling that appeals to couples who are excited to use them. They also have the potential charm that some guests will leave handwritten response messages that some couples love to save and treasure. If you are a couple who is excited to use traditional RSVP response cards, then you should go ahead and do it! But sometimes couples may have a feeling of obligation that they must use them to meet wedding expectations from others, even though they believe it will increase their costs and cause more work for them. Nowadays, there are many websites that allow guests to respond online with ease. 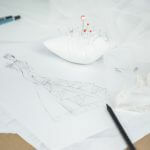 Some well-known examples include The Knot, WeddingWire, MyWedding, and RSVPify. Having guests respond online means that you do not have to purchase/print RSVP cards, RSVP envelopes, and potentially RSVP return stamps. It also means that you do not have to go through potentially hundreds of envelopes in the mail, open them up, and record the responses into Excel/Google Sheets. We chose to use RSVPify as our online RSVP system and couldn’t have been happier. We found that guests responded much quicker. I still remember my 25-year-old self that hadn’t sent physical mail since I was in elementary school, forgetting to reply that I was going to a friend’s wedding until last-minute because I didn’t have stamps or envelopes… I know, it was sad. But it shows the point that the younger generation is more likely to respond quicker to an online RSVP system than to a physical mailing system. You also get the benefit with most RSVP systems that you can export all responses to Excel, so it saves you all the effort of keeping track. You can even be notified via email instantly as each guest responds. Some people worry that it doesn’t look as formal, or it will offend some guests. I did not hear any complaints from guests, and I think as the population becomes more and more tech savvy people will increasingly choose this option for all its conveniences. You have enough things to do, and worry about already with the rest of your wedding planning! The only caution I would give is if you are inviting much older folks (great-grandmother) you may want to either invite them as part of a household that includes someone younger who can respond on their behalf, or reach out to them by phone to confirm attendance. You could always look at who hasn’t responded by a cutoff date and reach out to them manually anyway. For those that are interested in the convenience of online responses, but want to give your guest a choice, you could always offer both options. It is likely the majority of your guests would respond online, but for guests who prefer mail responses or want to leave a special message with their response they can use the RSVP card. We hoped this article helped you decide between Online RSVP vs Mail RSVP Cards. As a quick summary, if you love traditional mail RSVP Cards do it! But if you prefer online RSVP responses don’t worry about it offending anyone. According to TheWeddingReport.com‘s survey, 53.5% of respondents were in favor of online RSVP systems, so if that’s what you are leaning towards you don’t have to feel like you are going against the crowd. It also shows that plenty of couples still do prefer the personal touch to the traditional mail RSVP cards, so whichever option you pick, you have about half of couples supporting you. Let us know in the comments if you have any experience with either of the options that you’d like to share or if you have a strong preference either way. If you choose to do both online and mailed responses do you include stamped return envelopes for each invitation? If I was doing both I would probably include the return envelopes but not the stamps. I think the majority of people would respond online, and the people who prefer to respond by mail are likely to be a demographic of people that have plenty of stamps around. If you are ok with the budget impact you can include the stamps as well. For small weddings, it might not impact by much but if it’s a very large wedding and your barely able to make the budget, I think this is a pretty easy budget cut without much impact.